The Cost of Veneers: Are They Worth The Expense? Are you considering getting porcelain veneers to feel better about your smile? Click here as we examine the cost of veneers and they are worth the expense. Wondering if the cost of veneers is worth it? Millions of people have dental prosthetics such as veneers. With so many people signing up for beautiful smiles, it's easy to think that veneers are well worth the price. However, the cost may still be high enough to give some people pause. Are you deliberating on whether or not to invest in veneers? In this guide, we'll give you all the basics you need to know about veneers, including how much they cost and whether or not it's worth it for you. Keep reading to find the answers you need! Veneers are thin covers for the teeth that attach over the front of the teeth to make them look better. They're the same color as the teeth, and they're usually made of a resin-composite material or porcelain, and permanently attached to your teeth. These are used to treat different cosmetic issues with the teeth, such as to cover up chips, breakage, discoloration, or small teeth. For a few people, just one veneer is needed to cover up a single damaged tooth. But for many, multiple veneers help their smile appear even and symmetrical. The most common place to get veneers is along the top eight front teeth. Porcelain is the most common type of veneer material. These traditional veneers are applied using a more complex method than some new veneers called "no-prep veneers." No-prep veneers can be applied faster, in a less invasive process. For traditional veneers, the application process includes grinding away part of the tooth, even past the enamel in some cases. This helps get the veneer into the proper place. However, the procedure can hurt, and once it's done there's no way to reverse it. With the no-prep veneer option, the teeth might need to be slightly altered or prepared, but the alterations won't be as major. The layers of tooth beneath the enamel won't be affected, as no-prep veneers only involve prepping the enamel. They can often be applied without any local anesthetic at all. Veneers are often confused with crowns and tooth implants, but they are different. A veneer only covers the tooth's front surface. An implant covers up the whole tooth. Since veneers are a cosmetic procedure, your insurance won't help you pay for them. You can expect to spend a thousand dollars or more on each tooth, and they'll typically need to be replaced every 10 to 15 years. No-prep veneers cost slightly less, but need to be replaced every five to seven years. Over the long term, getting traditional veneers saves you money. However, other things can also affect how much veneers will cost. Different types and brands may cost more, and the cost is higher in some areas than others. You'll also pay more to get your veneers applied by an experienced dentist. Although it may be tempting to cut corners on costs by choosing a cheaper provider, you get what you pay for, and paying for an experienced provider is worth it. They're pricey, difficult to apply, and the procedure can be painful. With all that in mind, is it worth it to get veneers? Many people say yes - the benefits of veneers outweigh the costs. The major benefit is that they significantly improve the appearance of your teeth. You'll have a more even smile that you feel confident about, which can make a huge difference in your quality of life. Since veneers can last for 10 years or more, they're a long-term investment in your ability to feel good about your smile. Many people find that value to be worth the cost and hassle of getting them done. If getting veneers sounds like the right choice for you, you'll want to know what you're getting into. Here's how you can get ready for success with veneers. Before the procedure, you'll start with a preliminary dental appointment to talk about the best veneer options for you, as well as where you want yours. Sometimes, if your teeth are uneven, you'll need to get braces before veneers can be applied. In this step, the dentist will likely X-ray your teeth to see how healthy they are. 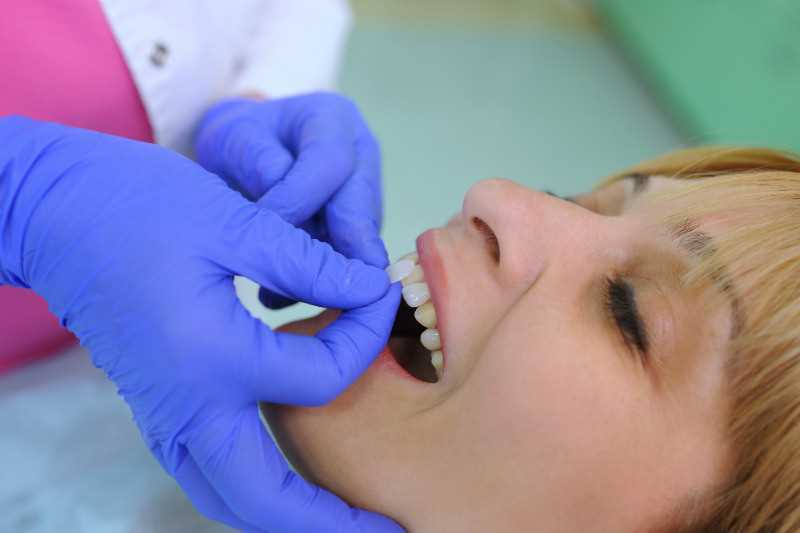 They'll check for gum disease, tooth decay, and whether or not you need root canals. If these procedures are needed, you might not be able to get veneers until after they're done. At your next dental visit, if you're a good candidate, you'll get sized for your veneers. The dentist will trim the tooth or teeth down by about half a millimeter with a grinding tool. Then, they'll get a mold of your teeth. They'll send the mold to a lab so your veneers can be made in the perfect shape. After the mold has been made, it takes about a week for the veneers to come back from the lab. Once your new veneers arrive, you can make the appointment to get them put in. Your dentist will take a look at the shape, fit, and color of the veneers to make sure they're just right. Then, they'll thoroughly clean your teeth. This helps ensure that no bacteria can get trapped beneath your veneers, where it would make your teeth start to decay. Next, a grinding tool is used to make the surface of your teeth rough, so the veneers will stick better. Dental cement is then used to adhere your veneer to your tooth. UV light hardens the cement, so by the time your appointment's over, your veneers are set to last for 10 years or more. Ready to Try Dental Veneers? The cost of veneers might be high, but for many people, it's small compared to the cost of living with teeth that you're not happy with. If you want to take your confidence back, veneers might just be the answer you're looking for. Looking for the right dentist to apply your veneers? Check out our testimonials here.